The way investing works today needs to change. Most portfolio design methods in current use neither enable investors to take full advantage of market returns potential nor do they protect investors from wealth destruction when markets slump. At the heart of the problem is the almost universal use of a portfolio design methodology called Modern Portfolio Theory (MPT) that was introduced over six decades ago in 1952. While markets have changed significantly since then, MPT has barely changed at all and the static, buy-and-hold portfolios it creates have trouble coping with modern, dynamic markets. The National Association of Online Investors (NAOI) has recently developed an alternative approach to MPT called Dynamic Investment Theory (DIT). It is designed to create market-sensitive investments that thrive in today’s volatile markets. 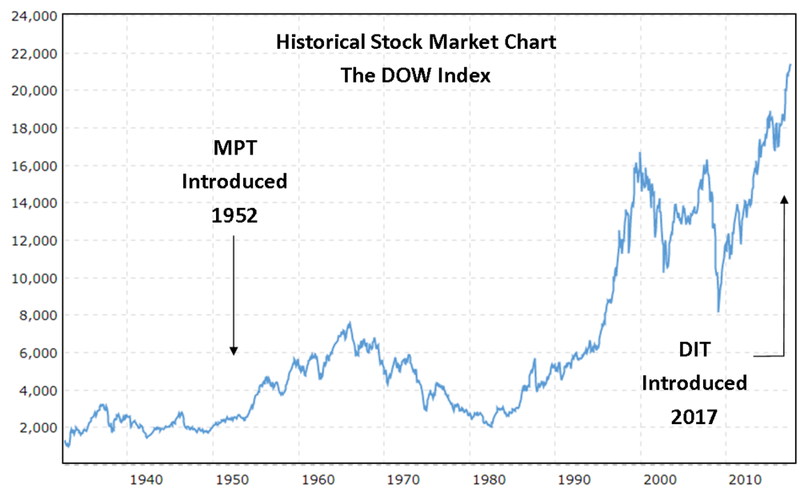 The DOW index price chart, presented below, shows that in view of the significant increase in market volatility since the 1950’s, change is long overdue. This article is the first in a series of articles that will be published on this forum showing how the DIT approach ushers in a simpler, less risky and more profitable future of investing. 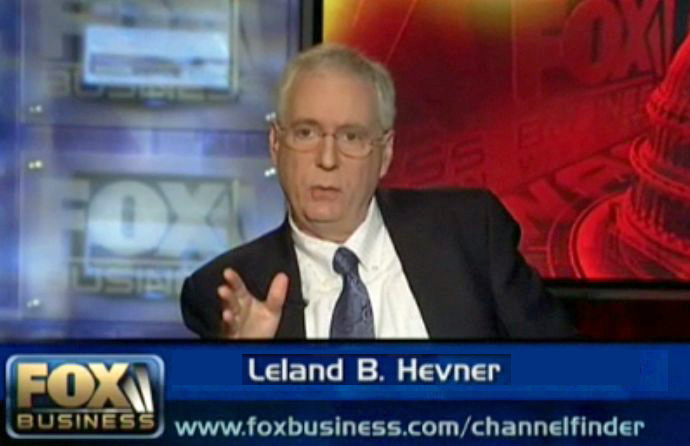 Allow me to introduce myself as Leland Hevner, President of the NAOI, an organization that I founded in 1997 to empower individuals to invest with confidence via education and the use of Web-based resources. Since our founding, thousands of individuals have taken our online courses, read our publications and/or attended our college classes. For over a decade we taught individuals how to create MPT-based portfolios, using asset allocation methods to match their risk tolerance levels. Our classes consistently received the highest ratings possible from students. Yet, in 2008, I stopped all NAOI education activities. In that year, when the stock market crashed, I watched in dismay as the portfolios we were showing students how to create crashed with it. I felt that I was doing them a disservice by teaching that MPT methods were the only way to invest. It was clear to me that more than education was needed to empower individual investors; also required was innovation. At that point I refocused NAOI resources on Research and Development to find an approach to portfolio design, and to investing in general, that worked better in modern markets. I needed to find an alternative to, or a replacement for, Modern Portfolio Theory. We began our R&D effort by working with individuals to understand what they wanted and needed in an investing approach in order to invest with confidence. I was adamant that any new approach would be defined by retail investors, not by the financial services industry. Fortunately the NAOI has access to thousands of individual investors who are NAOI members and who represent a broad cross-section of the investing public. I immediately saw that MPT met none of these goals and that we would need to start our development effort with a blank slate – as if MPT never existed. Our first task was to understand how investment trade decisions are made today. We found that virtually all are the result of subjective analysis and human judgments. And we saw that this opened the door wide to all types of risk elements including bad data, flawed analysis, sales bias and even investing fraud / scams. To meet our design goals, trading decisions needed to be made based on objective observations of empirical market data instead of subjective judgments. In other words, we needed to make investing a “science” instead of an “art” - which it more closely resembles today. To meet this goal we analyzed years of historical market price data and found that the only thing we can know about equity price movements with a high degree of confidence is that they are cyclical; they move up and down over time on a regular basis. We also know that the prices of different asset classes and markets / market segments move up and down at different times as illustrated in the figure below. These observations led us to the premise that at all times, and in any economic condition, there exists in the market positive returns potential. Our task then became to design a new investment type that could detect areas of the market that are trending up in price and capture their positive returns while avoiding areas of the market trending down in price. Unlike MPT portfolios that are designed to hold both uptrending and down-trending equities at all times in order to reduce risk, this new investment type would strive to purchase ONLY equities that are generating positive returns at time of purchase. Based on a multi-year R&D effort we developed an investment type that validated our premise and enabled us to create Dynamic Investment Theory (DIT) as the foundation for a new approach to investing. DIT establishes the logical basis and rule-set for creating a powerful new investment type that we called NAOI Dynamic Investments. Dynamic Equity Pool (DEP) – Here is where DI designers place ETFs or Mutual Funds that track indexes for asset classes or markets / market segments where the DI will search for price uptrends and thus positive returns. Note that I will use ETFs in the discussions below. Review Period – This is how often the ETFs in a Dynamic Investment’s DEP are ranked to find and purchase (or hold if already owned) the one ETF that is trending up in price most strongly. Trend Indicator – This is a simple indicator that is used at a Review event to determine the price trend direction and strength of each ETF in the DEP in order to rank them. Trailing Stop-Loss Order – Because a DI holds only one ETF at a time its value must be protected. This is accomplished by the use of a Trailing Stop-Loss Order that automatically sells the ETF if its price drops by a designer-specified percentage during the holding time period between Reviews. On an ongoing basis, a DI manager (or a computer program) uses the Trend Indicator to rank the ETFs in the DEP at periodic (e.g. quarterly) Review events. The ETF having the strongest uptrending price is then purchased, or held if already owned, until the next Review event when the ranking / trading process is repeated. No action is required by the manager should the price of the ETF currently held drop significantly. The Trailing Stop-Loss will automatically trigger a sale. Should the Stop-Loss sale be a “whiplash” event, it will be quickly remedied at the next Review event. The DI management process is extremely simple and can be performed by individuals of all experience levels using an online broker and data found on any number of free financial Web sites. Or, the process can easily be automated by a simple computer program hosted by an advisor / money manager. The Holy Grail of Investing? With the creation of NAOI Dynamic Investments we had met our goal of using objective observations of empirical data to make trade decisions instead of subjective human judgments. By doing so we eliminated a massive “human” risk factor that plagues investing today and introduced to the market a completely objective and systematized trading process. This is seen by many in the financial world as the “Holy Grail” of investing – if it works. I will discuss the observed performance of NAOI Dynamic Investments in the next article of this series.